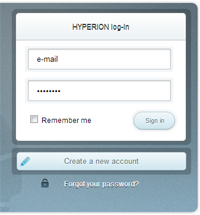 If the user has already registered during a previous visit, he enters his e-mail address and the password selected during the registration process in order to log in to the system. He may opt to select the Remember me option so that he is automatically logged in during future visits. If he forgets his password, the Forgot your password? link takes him to the password reset page. Once he enters the e-mail address he used to register with the system in the form which appears, the user will receive a prompt reply at that address, providing him with a new password. He may subsequently change it through the settings page should he so wish. The Create a new account link leads to the page where the user either enters his details for the first time or updates them if they have changed. 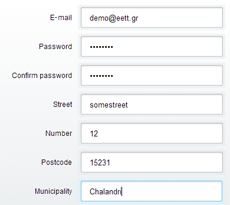 The first set of fields requests the user’s personal details. The password is entered twice to ensure it has been spelled correctly. 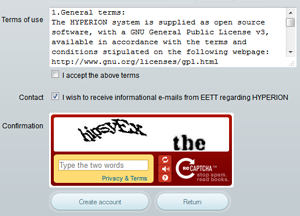 The user is prompted by appropriate messages, either if he makes a mistake or if he fails to fill in a given field. The remaining fields relate to the user’s broadband connection. In the second section of the form, the user fills in the address corresponding to the connection to which his measurements will be related. This information is essential for providing and displaying statistical data by region. An auto-complete connection between the postcode and the municipality allows this data to be automatically entered to ensure it is correct. Once these fields have been filled in, the geographical location will be shown on the map along with the attendant geographical coordinates. In the final section, by selecting the provider (ISP) and the agreed speed stipulated in the contract established between provider and user, connection features are defined. The registration process is completed by clicking on Create account and a message is sent to the e-mail address provided by the user. The message also contains the link to activate the new account. Clicking on Return cancels the procedure. The registered user sees the same data form. He may change his details using the Settings option. The only significant difference is that changing the password is shown as optional, so that the user is not being obliged to change, in case he doesn’t wish so. Attention: If the user changes any of the address or connection details, a new connection and consequently, a new record of measurements is created.